(The iPhone 8 and iPhone X are truly the hottest trends in the smartphones industry today, and they got reasons to be so. With their launch, the iPhone series is celebrating its 10 years in the market, but it appears as if it was yesterday when Steve Jobs, founder of Apple announced the iPhone 1st generation in a conference back in 2007. A smart Mobile device with a 3.5-inch display, 4 GB storage, 2 mp rear camera and other features which were enough to mesmerize the users back then. 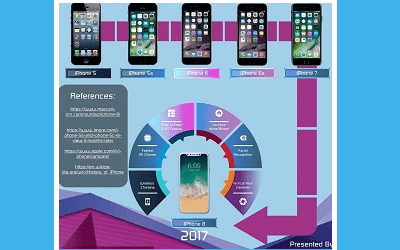 It’s company’s 10th anniversary now, and we believe not every one of us has been lucky to use all the models of iPhone, so we thought it would be great if we would be able to learn something about each iPhone launched till now. iPhone 8 and iPhone X both have been revealed on 12th September at the Steve Job’s Stadium. There have been some of the major upgradations to the new iPhones, which would definitely be loved by the users. Both the new iPhones now feature wireless charging by airpower and whole new A11 Bionic chipset, which is 30% faster as compared to the A10 chipset.iphone 8 comes with a retina display while the iPhone X features a Super Retina Display. The iPhone 8 is likely an upgrade to iPhone 7 and with some new features like wireless charging and some camera enhancements. On the other hand, iPhone X came as a surprise to the people. With no home button and all-screen display, the new iPhone X now features the face recognition technology, replacing the touch id. It also now has vertical rear cameras. In iPhone, X Apple has used a 5.8″ OLED Super Retina Display, which is one of the finest display launched by Apple on any iPhone. The booking for the new iPhone 8 and iPhone plus will start on 12th September and shipments from 23rd September. Price for the devices is set to be between $699 to $949. However, for iPhone X the customer’s have to still wait for a little while, as it will be available for buying no before than 3rd November 2017. The price for iPhone X starts from $999 and goes up to #1149. Other than the launch of iPhone’s on the big event, Apple also brought forward its new 4K Apple Tv and Apple watches 3.